In my last blog post, I explored the roots of the Gold Sovereign from its very beginning in 1489, before it was forgotten for over 200 years, until 1816, when something momentous happened in the history of British coinage. Let me explain. In the early 19th century, the effects of the French Revolutionary Wars and the Napoleonic Wars led to severe financial instability in Great Britain. A number of bad harvests pushed food prices up and limited silver and copper supplies resulted in a coin shortage. The need to stabilise the currency became crucial and The Great Recoinage was the first step in this process. The aim was to re-introduce silver coinage and the decision was also made to change the country’s gold coinage to replace the Guinea, Britain’s major coin of the 18th century. And so the ‘modern’ Gold Sovereign was born. Struck in the same 22 carat gold as the gold Guinea and 20/21 of its weight with a £1 denomination, it was decided to return back to Henry VII’s era for its name. The new Sovereign was a decided contrast to its medieval predecessor. It was half the weight and just over half the diameter of the 1489 version. But the Sovereign had not been heard of for more than 200 years and was not widely known at the time. 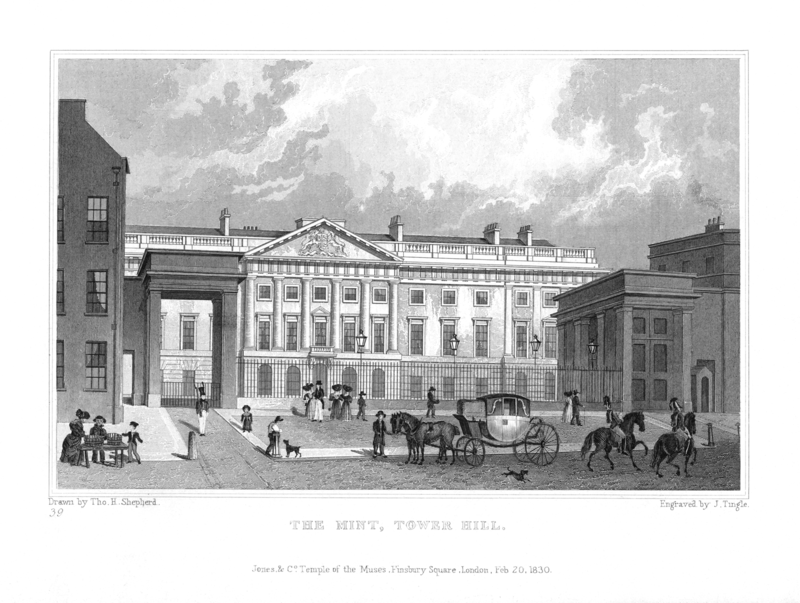 William Wellesley Pole was tasked to reintroduce the Sovereign and bring the ancient institution of The Royal Mint into the age of Industrial Revolution. Pole decided to move The Royal Mint from its cramped traditional home in the Tower of London to nearby Tower Hill in a purpose built facility, which featured brand new steam powered coin presses. This was a revolutionary move for the Mint. And with the new facility in place, Pole turned to his protégé, Benedetto Pistrucci to design the new flagship gold coin. Find out about Benedetto Pistrucci’s design in Part III of my 200 years of the Sovereign Blog Series – Click here to read it.